It seems a lot longer, but the planet Neptune was discovered one year ago today. You may recall hearing about Neptune when you were a child, and you may even have read about it in books from the 19th century, but the fact is it's only been a year since German astronomer Johann Galle discovered the aquamarine orb out in the hinterland of the solar system. A Neptunian year, that is. Galle identified the planet in September 1846. Only now has Neptune returned to the same spot in its wide orbit, taking 164.8 Earth years to complete a single circuit around the sun. "One of the things that make it unique is it was the first planet that was discovered through mathematics," said John French, a presenter at Michigan State University's Abrams Planetarium. Astronomers in the 19th century noticed the planet Uranus seemed to be deviating from its predicted orbital path and figured the gravity of another, unseen, planet must be tugging on it. Mathematicians Urbain Le Verrier of France and John Couch Adams of England separately calculated where that other planet must be located. Galle peered into that part of the sky and found Neptune. Similar study of Neptune's orbit led to the discovery of the mini-planet Pluto in 1930, French said. 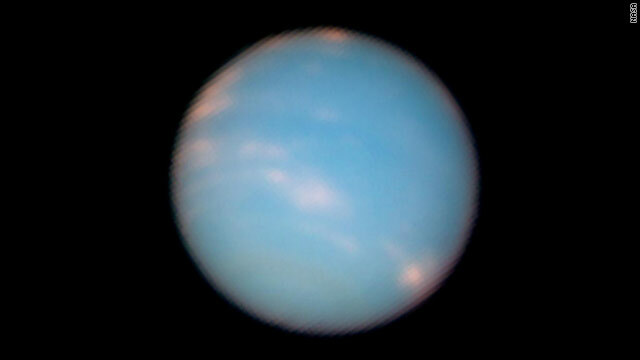 NASA's Hubble Space Telescope took some birthday pictures of Neptune. They show the planet's Earth-like tilt, which means it has four seasons too - except that on Neptune, each season lasts about 41 Earth years. It's summer in Neptune's southern hemisphere right now, but vacationing there could be a challenge. Since the planet is composed of gaseous hydrogen and methane, "there's no ground to lay your blanket on and stretch out and bake in the sun," French quipped. Neptune is 2.8 billion miles from the sun, 30 times as far as Earth, according to NASA. You can see Neptune with binoculars or a small telescope in the constellation Aquarius, close to the boundary with Capricorn. It has 13 moons, including Triton , which NASA's Voyager 2 spacecraft discovered has geysers, French noted. "So, future vacationers can go there and watch the geysers on Triton," he said. So by using an approximate age of our solar system, Neptune has only orbited Sol albeit approximately 33980582.524271844660194174757282 times, LOL! I'll betcha "God" had a fun time with THAT orbit too, huh, you religion freaks.